Remembering Oneness or the Grand Adventure of this Time! We are one with divinity, and only mind ideas interfere with an experience of this truth. We all have mind ideas that have run interference with experiencing the truth of oneness: false ideas, inherited or picked up from other lives or our cultural milieu. One central focus of our Flower Essences has been to help dismantle these mind ideas and cut through the illusions to truth. Flowers are good at this because they experience their oneness with divinity while grounded in physical form, and that is what each of us is called to experience: conscious divinity while in physical incarnation. One group of mind ideas are particularly pervasive because they are the agreed upon cultural ideas. These are the patriarchal values of our current civilization. On the surface, the mind ideas of patriarchy sound rather helpful, even valuable. What are the problems with these mind ideas? To reframe the question, WHY are these values just mind ideas and not eternal verities? When we ground the experience of oneness in our physical bodies and live in that experience, any need to accomplish for the sake of productivity or to work to be better than anyone else simply melts away as ridiculous notions. Why any need to be more than someone else or increase productivity or set goals to be more than we were before or have our right hand be smarter than our left hand or imagine we have to strive to be something more than we already are when we are one with God? And frankly, I’m ready to see what it is like to move beyond values that have us blowing each other up in a nutty race to be better than our neighbors. As the bumper sticker says, “An eye for an eye leaves the whole world blind”…… and leaves us stuck in an illusionary state of isolation from each other. Anyways, I trust that when we all recognize we are one with each other, we will be interested in doing something more than just examining our navels, like maybe take care of each other. My discussion of this is really an academic exercise because this patriarchal subset of mind ideas as well as our own little quirky mind ideas are about to be swept away by the vibrational shifts on the planet. As the light pouring into the planet takes us to a felt experience of oneness, I think often of Marian Woodman, a Jungian therapist who brought much to the table with her work on the Sacred Feminine. Her particular focus in helping to dismantle patriarchy was the body/ spirit split and the way patriarchal culture has used mind ideas about a split between the body and spirit as a way to prevent us from experience our oneness with God. She felt the healing would come when we experienced our physical bodies as divine. Good news, Marion! The time is now! My experience of the light pouring into the planet right now is that it is downright amazing! Our job is to assimilate this light into our bodies. Therefore, as I work in the gardens this summer, I am focusing on making Flower Essences that help us assimilate this wonderful light into our physical bodies so we remember our oneness as a physical experience. And to re-interate, Flowers are up to the task as Flowers exist in the physical yet know their divinity. They are the vibrational role models for this wisdom because they experience their divinity in form. Wisdom itself is not an idea. This is why our electrical systems can recognize the wisdom of Flowers and use it to cut ourselves free from mind ideas and return us to an expanded experience of our self. As we take this journey, it may be a bumpy ride. Few children learn to walk without falling down, and few of us will fall into an experience of oneness without falling in and out of this place for awhile. One challenge we have been hearing about from you all is that while moving in and out of the expanded state of oneness sometimes we can get confused about all the personality information we are experiencing as we come and go from oneness. Somewhat like the experience of being empathic, we can get disoriented by all the illusionary personality data that floods our energy field when we go from an expanded state back to a personality driven one. These growing pains are temporary as we will get better at being in oneness. The Angels suggestion is to go deeper when this sort of overwhelm of knowing occurs. The solution, they say, is always to go deeper. For me, I think of this as a physical thing, a going deeper into my heart. This grounding in the heart takes us beyond the territory of personality. And this is helpful because we are not moving towards oneness on the personality level but on the soul level. Here are a few of the Flower Essences that are available to help us assimilate the higher vibrations coming into the planet to help us experience the high vibration of divine oneness- We have a bigger list which we would be happy to share and by the end of the summer I expect we will have more new Essences to support us with this epic paradigm shift. We are working with the Angels every day to get a comprehensive collection of support for this wonderful wild time! Keep checking in with us for new Essences! 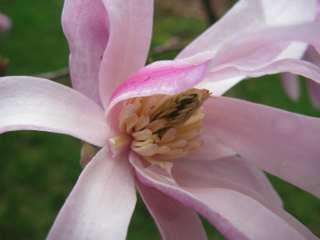 Pink Magnolia- New this spring, this one helps us embrace a vibration of rebirth and cellular awakening. This Flower Essence’s time is now, and its focus is to usher us into a felt experience of oneness. 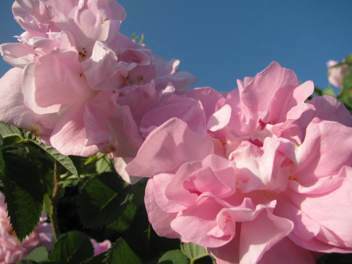 Agathe Incarnata Rose- This Rose’s name literally means “good body rose” and it’s focus of support is to help move us beyond the mind idea of a body/spirit split. 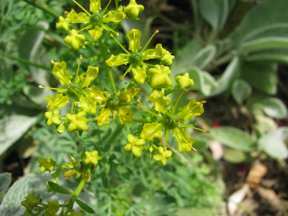 Rue- This Flower is also called the Herb of Grace. This expansion into oneness is by the grace of God, and this one helps us remember that this energy coming into the planet is a cosmic gift, and our job is to receive it fully with gratitude. 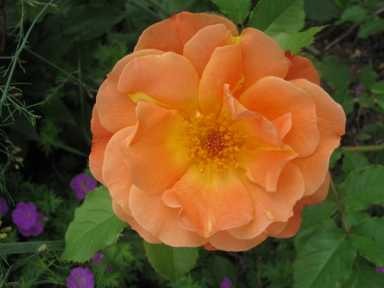 Westerland Rose is proving as helpful as last summer with soothing and revitalizing us as we leap through one paradigm shift after another! This week our Lady of Labels, Lynn Tidman, threw in her pens and retired from Green Hope Farm. For two decades she wrote the vast majority of our Flower Essence labels. During these last few years writing the labels, she would often rub her sore thumbs at the end of the day and muse about how many labels she had written over the years. I was always a bit afraid to tell her because I thought it would scare her away. We are talking well over a million. That is a lot of labels! Lynn was the first person to come to work here at the farm so imagining a week without her is…well….impossible. In her first year here, Lynn filled every Flower Essence bottle from a pyrex cup at our kitchen sink while I sprinted around her packing boxes in the playroom and taking orders in the living room. The pantry became her personal kingdom as it was the storage place for all the Flower Essences she was bottling. When Jim returned home from work each night, it was hard for him to miss that thanks to Lynn there was less and less room for food and more and more bottles at the ready. The children were tiny and the place bustled with the comings and goings of a lot of interesting and unusual visitors. Lynn loved it all. As an only child, she relished being in the middle of every bit of chaos. When it became clear that we needed to build the first of several additions to our farmhouse, she worried the kooky quality of her days at the farm would be lost. Once settled into our next headquarters, she realized the change of locale had not ruined the fun. It wasn’t long before we realized that we needed one person to dedicate herself to the label writing. Lynn won by default as the expanding group of people at the farm all had terrible handwriting….. except for Lynn. And so by default, Lynn became our Lady of Labels. I have always loved her soft round letters. There has always been something comfortable and inviting about her handwriting for me. Today, as I pulled labels from our inventory in preparation for tomorrow’s bottling, it was the first time I knew there would be no more Lynn labels when we run out. It is hard to imagine. As many of you know, Lynn grew up on Bermuda. Her childhood was magic, except perhaps for a teacher named Mrs Cuppleditch. Lynn lived on the water in a pink house that faced the city of Hamilton. She had her own little motorboat to tool around in with her dog and took a ferry to school each day. On land, her parents couldn’t keep her away from the tennis courts, and her love for racquet sports remains a constant to this day. Lunchtime ping pong has seen many a Sheehan and many a staffer crushed by Lynn. In her twenties, Lynn moved to Vermont. She took to the climate better than most tropical transplants and made a home first in Stowe then in nearby Norwich . Her house in Norwich is one of my favorite houses on earth. Just like her handwriting, there is something wonderfully comfortable and inviting about the place. I know I seem to drone on a lot about houses that work, but so many don’t. When I find a home that feels happy, like the one in Maine I mentioned last month or like Lynn’s place, I feel happy too. I have loved my many visits to Lynn’s house ( Lynn if you are reading this post, call me and I will be right over to lounge on your couch and yes, I will bring the dogs). I met Lynn twenty years ago when our then neighbor Malcolm Grobe was having a dinner party for a motley crew of folks he had married during his oft times unorthodox years as a minister. Malcolm was definitely a free spirit when it came to his wedding services and going to a wedding with Malcolm in charge was always an adventure. His props often included ponies and other farm animals. At Lynn and George’s wedding there had been a puppy and a teddy bear. I was never quite sure why Malcolm had invited me and Jim to this particular party since we hadn’t been lucky enough to have him preside over our wedding, but I am awfully glad we he did. While Teddy ( who for many years to come would sit next to Lynn in the office putting Lynn’s labels on the bottles) cooked a feast for us, Malcolm asked me to give everyone at the party a tour of the Green Hope Farm gardens. Lynn asked a bizillion questions and then invited me over to ask a bizilion more. We never looked back! As perhaps the preppiest looking person on Earth, Lynn surprised me with her embrace of all things new age, and I think she surprised some of her old friends too. When she began to work with the Angels and Elementals in her own gardens, the results were stunning, and it wasn’t long before she was hauling me off to Bermuda to meet the Flowers and gardens of her island home. Thus began many a trip in which we visited every last garden on this garden island and talked to just about every Flower we met. There was something about the trips that brought the teenager out in the two of us, and we had so much fun and laughed so hard on these Flower Essence missions. It was a wonderful joyful time. When my business got busier and busier and it became harder for me to drop everything and go to Bermuda, I could count on Lynn to find and make wonderful Flower Essences. I would give her a list of what we needed, and she would always return with these Flower Essences but she would always bring new ones too. She had a real sense of what Flowers had a lot to offer, and it was always like Christmas when Lynn arrived back at the farm with new Essences. Those were such different days when no one cared that we were hauling cases of full canning jars to and fro from Bermuda to the farm. A childhood friend of Lynn’s who worked in customs at the Bermuda airport would usher us through the line telling folks to make way for the potions. Hard to imagine isn’t it? Now I thank God for my greenhouse and all the Bermuda plants I collected over the years that bloom for me here! Over the years Lynn remained a true friend through thick and thin (and no doubt will remain one!). When my family of origin drama blew up, Lynn was the most concerned adult in our lives and stepped into the fray to play the role of grandmother to our children at graduations and recitals and plays and concerts. She would pop on her pearls and meet us anywhere. Just this spring, she made sure to be the second person to buy Lizzy’s book ( Will insisted on being the first). And of course there was her relationship with all the animals here! She is the Ava Gardner of the animal kingdom, and we remain in awe of her talents. I have never met a dog that didn’t fall for Lynn like a ton of bricks, and frankly when I go visit Lynn from here on out MayMay and Riley will be riding shotgun. MayMay in particular waits for Lynn at the door in the morning primed for a love scene that makes us all blush. How grateful I am for all Lynn’s love. No matter what was going on in her life, she arrived here each week cheerful and generous, interested in each person’s life and full of a sense of the absurd as well as a passion for our work with Animals and Flowers. Viva our Lady of Labels! Long Live Lynn! This week our Lady of Labels, Lynn Tidman, threw in her pens and retired from Green Hope Farm. For two decades she wrote the vast majority of our Flower Essence labels. During these last few years writing the labels, she would often rub her sore thumbs at the end of the day and muse about how many labels she had written over the years. I was always a bit afraid to tell her because I thought it would scare her. We are talking well over a million. Lynn was the first person to come to work here at the farm so imagining a week without her is…well….impossible. In her first year here, Lynn filled Flower Essence bottles from a pyrex cup at our kitchen sink while I sprinted around her, packing boxes in the playroom and taking orders in the living room. The pantry became her personal kingdom as it was the storage place for all the Flower Essences she was bottling. When Jim returned home from work each night, it was hard for him to miss that thanks to Lynn there was less and less room for food and more and more Flower Essences at the ready. The children were tiny, and the place bustled with the comings and goings of a lot of interesting and unusual visitors. Lynn loved it all. As an only child, she relished being in the middle of every bit of family and farm chaos. When it became clear that we needed to build the first of several additions to our farmhouse, she worried the kooky quality of her days at the farm would be lost. Once settled into our new headquarters, she realized the change of locale had not ruined the fun. It wasn’t long before we realized that we needed one person to dedicate herself to the label writing. Lynn won the job by default as the expanding group of people at the farm all had terrible handwriting….. except for Lynn. And so, Lynn became our Lady of Labels. I have always loved her soft round letters. There has always been something comfortable and inviting about her handwriting for me. Today, as I pulled labels from our inventory in preparation for bottling, it was the first time I knew there would be no more Lynn labels when we run out. Gulp. In her twenties, Lynn moved to Vermont. She took to the climate better than most tropical transplants and made a home first in Stowe then in nearby Norwich . Her house in Norwich where she raised her two children is one of my favorite houses on the planet. Just like her handwriting, there is something wonderfully comfortable and inviting about the place. I know I seem to drone on a lot about houses that work, but so many don’t. When I find a home that feels happy, like the one in Maine I mentioned last month or like Lynn’s place, I feel happy too. I have loved my many visits to Lynn’s house ( Lynn if you are reading this post, call me and I will be right over to lounge on your couch and yes, I will bring the dogs). I was never quite sure why Malcolm had invited me and Jim to this particular party since we hadn’t been lucky enough to have him preside over our wedding, but I am awfully glad he did. While Teddy ( who for many years to come would sit next to Lynn in the office putting Lynn’s labels on the bottles) cooked a feast for us, Malcolm asked me to give everyone at the party a tour of the Green Hope Farm gardens. Lynn asked a bizillion questions and then invited me over to ask a bizillion more. We never looked back! As perhaps the preppiest looking person on Earth, Lynn surprised me with her embrace of all things New Age, and I think she surprised some of her old friends too. 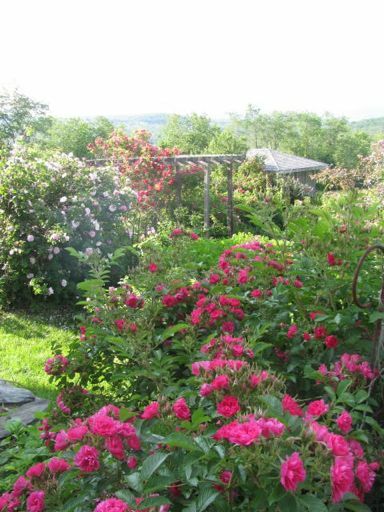 When she began to work with the Angels and Elementals in her own gardens, the results were stunning, and it wasn’t long before she was hauling me off to Bermuda to meet the Flowers, the Devas of this wise old place and the ancient gardens of her island home. When the business got busier and busier and it became harder for me to drop everything and go to Bermuda, I could count on Lynn to find and make wonderful Flower Essences. I would give her a list of what we needed, and she would always return with these Flower Essences, but she would always bring new ones too. She had a real sense of what Flowers had a lot to offer, and it was always like Christmas when Lynn arrived back at the farm with new Essences. Over the years, Lynn remained a true friend through thick and thin (and no doubt will remain one!). When my family of origin drama blew up, Lynn was the most concerned adult in our lives and stepped into the fray to play the role of grandmother to our children at graduations and recitals and plays and concerts. She would pop on her pearls and meet us anywhere. Just this spring, she made sure to be the second person to buy Lizzy’s book ( Will insisted on being the first). And of course there was her relationship with all the animals here! She is the Ava Gardner of the animal kingdom, and we remain in awe of her talents. I have never met a dog that didn’t fall for Lynn like a ton of bricks, and frankly when I go visit Lynn from here on out MayMay and Riley will INSIST on riding shotgun. MayMay in particular waits for Lynn at the door in the mornings, primed for a love scene that makes us all blush. How grateful I am for all Lynn’s love. No matter what was going on in her life, she arrived here each week cheerful and generous, interested in each of our lives and full of a sense of the absurd as well as a passion for our work with Animals and Flowers. Viva our Lady of Labels! Happy Retirement! Long Live Lynn! Yes…..the Iceman cometh and his name was Bob or Angel Bob as we like to call him because when our newly delivered replacement refrigerator arrived BROKEN last week, Bob managed to get here only a week later to repair it- which in repair speak is well… a world record. And so now, thanks to Bob, we have space for all things icy and cold……most importantly….. something cold for Will to drink when he finishes mowing the lawn today……..and lots of space for food if I ever get motivated to leave the gardens long enough to get groceries. The Trail is on the move! 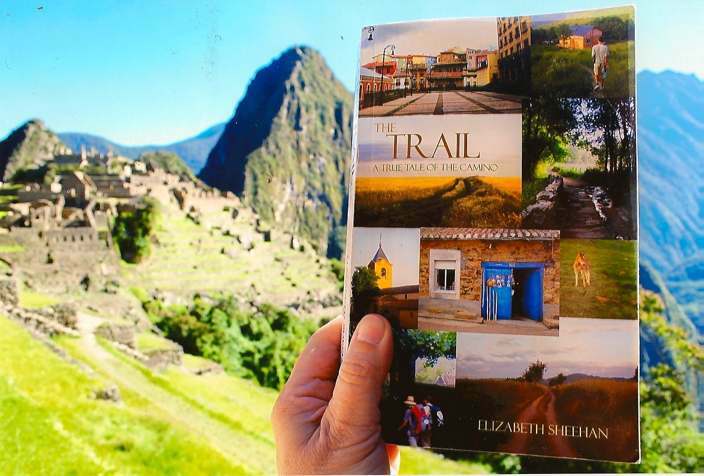 We’d love to post photos of where you have taken your copy of The Trail!